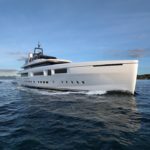 Argo is the most talented all-in-one Explorer yacht with extraordinary elegant lines and functionality designed by Ken Freivokh and proposed by Rossinavi. The exceptionally versatile open aft deck, the largest open space within her class, is a dream for outdoor activities and for hosting the ultimate trends of tenders and toys. ARGO’s long-range comfort will let her owner cruise the World from high altitudes to rivers that run through jungles and deserts as a real Expedition. 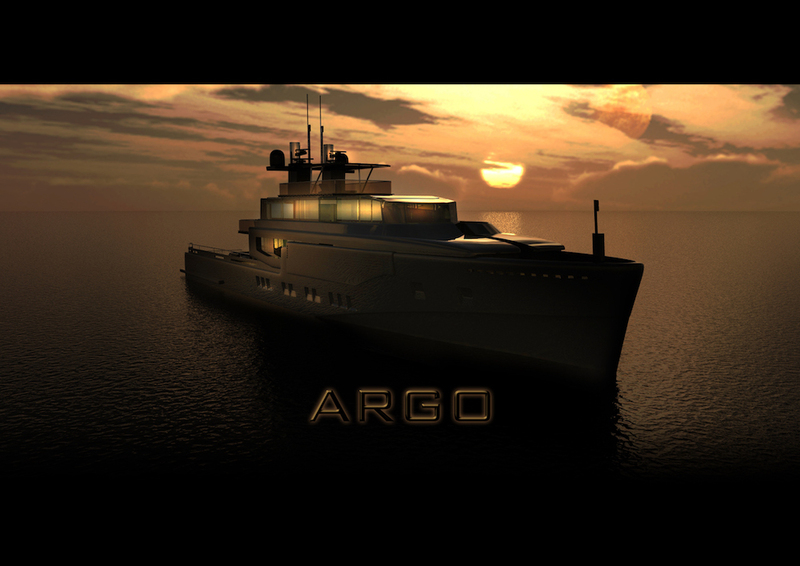 Argo has been designed as a proper exploration and support yacht, with purposeful styling targeted at functionality and operational considerations. With a custom designed crane capable of launching and recovering up to four 12m tenders and/or submarines or amphibious vehicles from two decks, it is an ideal shadow yacht or standalone expedition yacht. The aft deck is fitted out to suit touch-and-go helicopter use. Further, as an option, the lower deck aft can be fitted out to include a proper beach club, with a wide opening aft to the full beam swim platform. Unique at this size, Argo offers a private elevated owner’s deck, including a full beam cabin, a private terrace, a study and a further family or nanny cabin, VIP stateroom or indeed captain cabin. The generous elevated aft deck can be accessed directly from the main deck terrace, and a further spiral stair provides easy access to the crow’s nest with 360 degree views. Also unique at the size is the total segregation of the crew block, which enjoys its own vertical circulation right up to the bridge, and down to a deck housing laundry, utility, stores. At main deck level there is a most handsome open plan saloon/dining/bar area which opens to the sea and to a protected terrace aft, creating a separation to the tender deck. The four guest staterooms all enjoy panoramic windows to the sea with direct access to the saloon. The forward guest staterooms include Pullman berths, so potentially Argo could take the full MCA guest complement of 12 guests. The top observation deck is planned under louvres to control the sun and offer amazing all-round views. Argo makes full use of the latest glass technology, with uninterrupted windows all-round the bridge and owner’s deck. 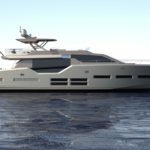 Designed to optimize accommodation and internal volume within the constraints of the MCA 500 Gross Tonnage rule, it offers great internal and external space without the additional costs and complexity of a yacht in excess of 500GT, and indeed without the crew and operational restrictions and requirements of a yacht in excess of 500GT. Argo is targeted to be elegant and beautifully proportioned, without pretending to be a ‘gin palace’ – it makes a purposeful, yet quite unique statement totally in keeping with a purposeful, highly versatile and totally timeless yacht. 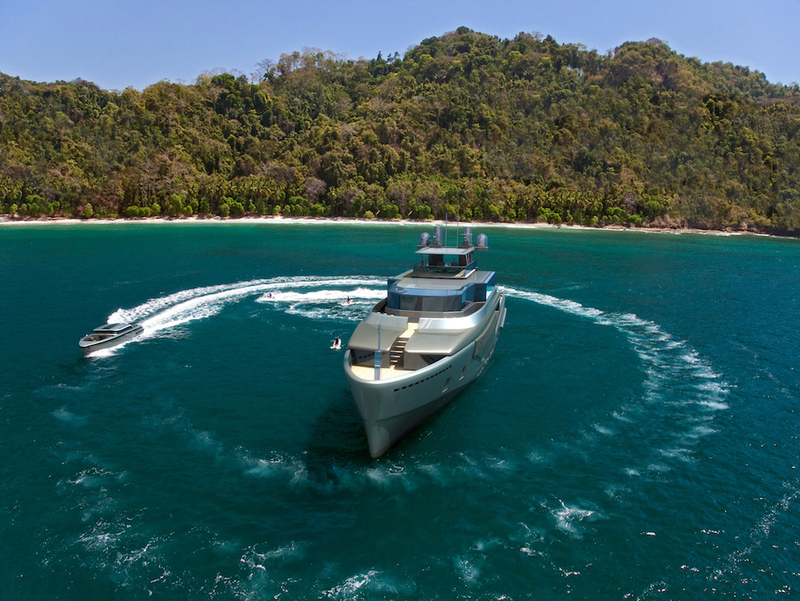 Equally at home exploring the Artic or deep into the Amazon Delta, this is a go-anywhere, do-anything yacht. A true, all purpose, latest technology, pocket superyacht. Shipyard’s statement on Argo A private boat is a place where you spend your free and joyful time. The boat can be placed in the most exclusive ports and marinas where you can host gala parties or it can be a place where you just relax. There is however also segment of yachts with the same joyful characteristics with other navigation scopes: the “Explorers” and the “Expeditions”. 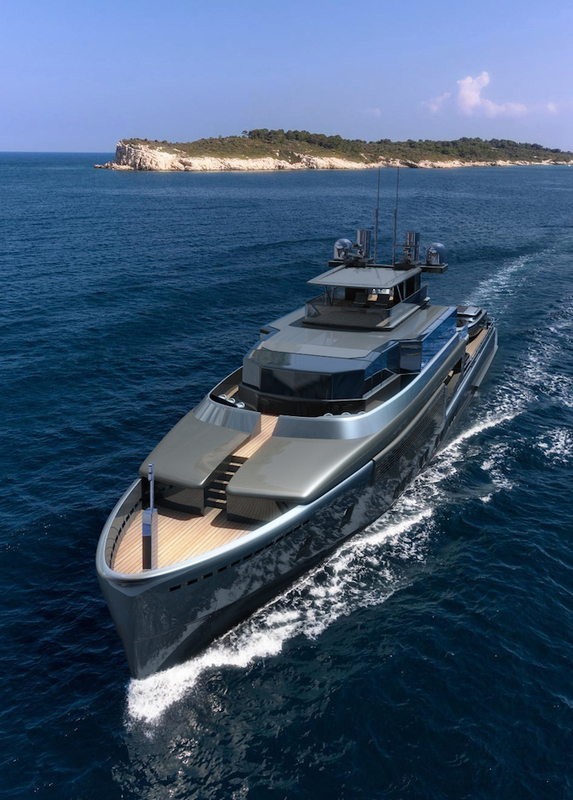 Currently at Rossinavi, they are building an expedition, a yacht that has been thought for the Pacific Oceanic crossing, with two big tenders hosted in the forward bow garage. It is a yacht that balance the exploration with onboard luxury of fine living. With that know-how, they are changing the mix of the elements again with the Argo project, rethinking the entire boat concept. They are moving the attention more on the ludic, adventure, external living than the internal living aspects; this is in fact a real Explorer project. Argo embarks 4 big size toys plus some small ones (like jet skis). They can board, a big fast limousine tender, a small submarine for underwater exploration, an amphibious vehicle and also a service tender for the crew. 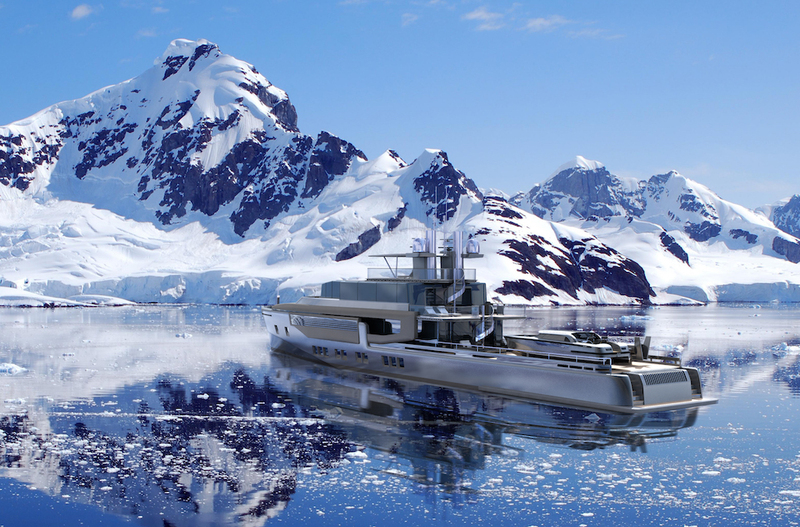 The yacht has been thought to be constructed totally in aluminum and Rossinavi’s technology allow to build aluminum ships that can obtain “D” Ice Class. 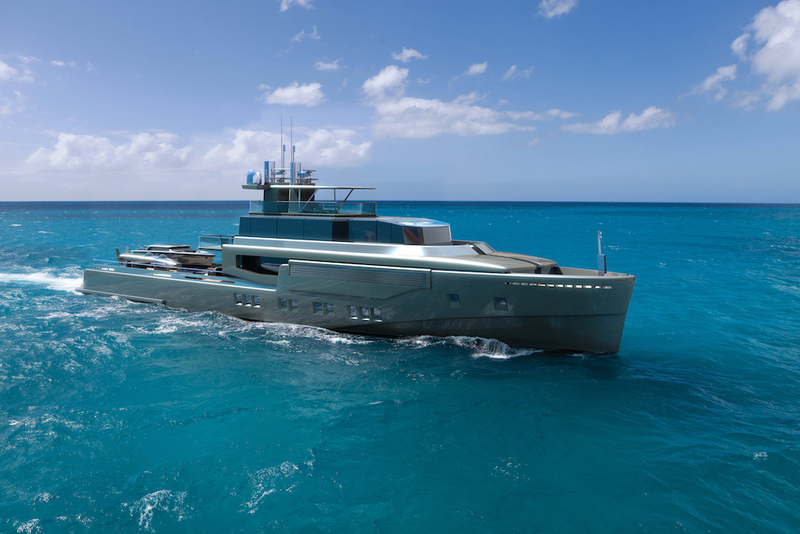 This yacht is born with a nautical range of more that 5000 nautical miles. The two hatches of the large garage placed on the aft deck of Argo has a pantographic opening system; we decided for that functionality aiming to avoid any kind of problems due to wind presence during the launch/boarding of the toys. The pantographic hatch system is produced by our own workshop and will be installed also on our Expedition. Argo is the first project we are developing together with Ken Freivokh and the feeling has been great already from the start. 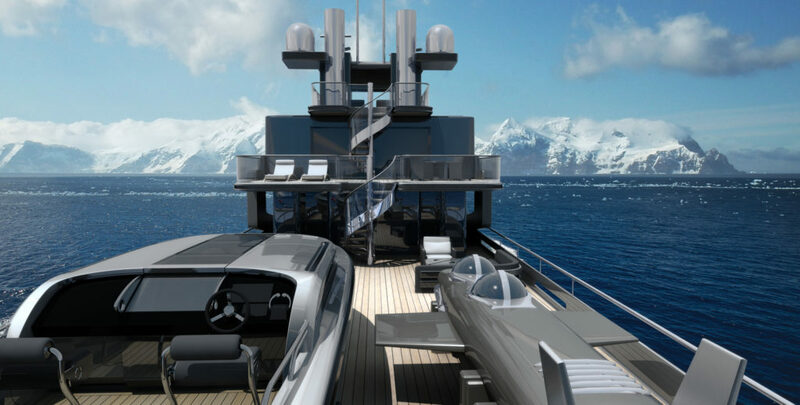 They are now working together on this explorer yacht concept that Ken initially designed with a LOA of 42 meters, which we fell in love. The Argo has also an alternative propulsion system, the pod version. This alternative proposal is placing two Rolls-Royce pods instead of the traditional shaft lines system with propellers. This proposal is perfect for who is aiming to cruise in perfect silence having at the same time extra maneuverability but with the pod basement in the stern most of the garage space will be lost. What will be maintained in both cases is the impressive space on the stern side of the aft deck under the full panoramic view from the owner’s cabin. They are also giving a particular attention to comfort and soundproofing. Argo has a fast displacement hull with a very good seakeeping performance. The hull has been tank tested for trimming and rolling, Argo will also be equipped with electric pin or gyroscopic stabilizers. 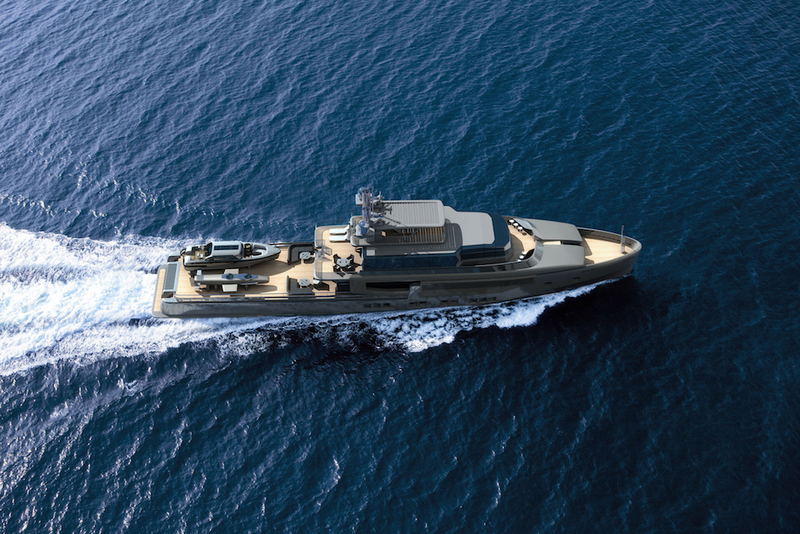 The entire Argo Project has been designed with a full implementation of “Zero noise” technology, an engineering process which will affect the complete naval architecture of the boat (insulation processing, air and structural noise circulation, glasses interlayer selection, noise fonts analysis, selection of interior materials and more).